In Fallout 76, you'll need to be constantly collecting junk to scrap into crafting materials. Some components are vital for building essentials like weapons and armor, and they can be pretty tricky to find. One such component is Aluminum (or Aluminium for the non-Americans out there). Aluminium is used in weapons repairs, and crafting of building materials, and it's not all that easy to find. To help you out, we've detailed some great ways to farm Aluminium in the guide below. In this Fallout 76 Aluminum Guide, we'll list all of the items you can scrap to get Aluminum, and also some great places to stock up, let's take a look. For more on Fallout 76, be sure to head over to our Fallout 76 Guides Hub. It has a ton of helpful info on the game, from advice on the best weapons to use, to an explanations of the updated Perks system. Aluminium is an incredibly useful resource to keep an eye out for in Fallout 76. You’ll need it to craft a Workbench, which is essentially one of the first things you should be looking to build when starting out. You’ll also need it to repair certain weapons and armor, which you’ll need to do often, thanks to Fallout 76’s degradation system. Let’s take a look at some of the places you can get Aluminium in Fallout 76. Since you’ll be using it a fair bit, it’d be good to know exactly where you can pick up Aluminum in Fallout 76. We’ve listed some known locations below, as well as some general items that you should be keeping an eye out for while exploring. 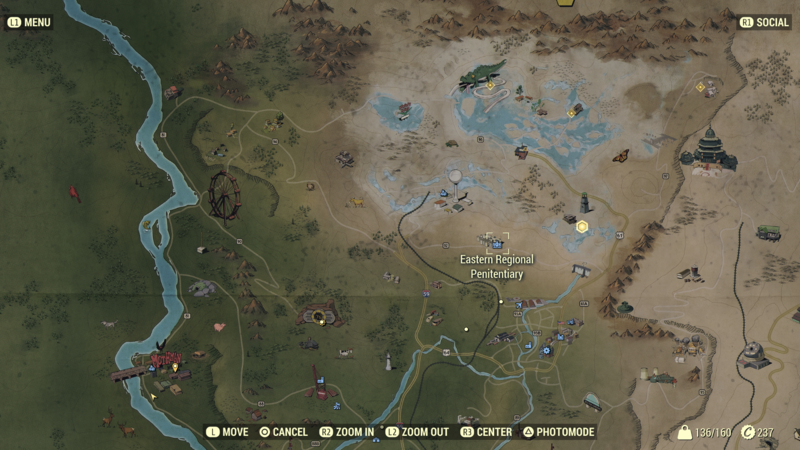 Just West of Fallout 76 is a racetrack. There’s a public workshop with a nearby Aluminium Vein. Mountainous and Stony areas are your best bet for finding Aluminium. The hills and mountains around the Savage Divide are a particularly good spot. There are areas of fertile soil in the Flatwoods area. Aluminium can be harvested from these areas. Aluminium can be scrapped from aluminum cans, alarm clocks, coolant caps, sensors, trays some toys, Tweezers, Aluminium Canisters. So far we've only found one location that offers a particularly high quantity of Aluminium. It's in the Eastern Regional Penitentiary. This is a prison area that sits at the center of the map, we've included an image below. The area you'll want to focus on is the cafeteria inside the building. It is, rather unsurprisingly, filled with Dinner Trays. These can be collected and scrapped at Camp to get Aluminium. Loading back into a new server will respawn the Trays as well, so rinse and repeat! When out looking for Aluminum in Fallout 76, be sure to head into the menu and tag it. This will highlight all Aluminium when looting. It’s handy to make sure you don’t miss any while looting. You can either do this in the crafting menu by highlighting Aluminium in a recipe, and pressing the tag button, or by heading into your inventory and tagging it there.